It is the soft time of evening. On Dada's porch we listen to the sounds that attend the approaching night: people speaking softly as they pass along the roadway, children's laughter, dogs barking, a baby crying and being comforted; in nearby houses kitchen sounds—of pots being moved, water being poured. We sit with our cups of sweet tea watching the shadows lengthen, the colors dissolving into darkness. We see each other silhouetted against the last light, and then it is just our disembodied voices that appear to float in a blackness punctuated now and then by the striking of a match or the glow of Dada's cigarette. The conversation is quiet ... the silence often conveying more than the words. 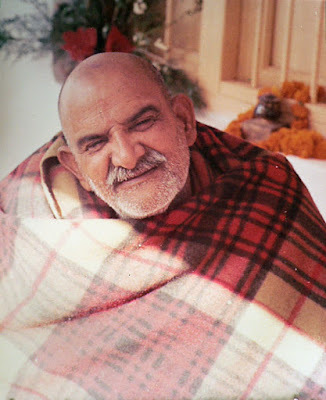 We are savoring stories about our Guru, Neem Karoli Baba ("Maharajji" or "Baba" as his devotees call him); how he came into each of our lives, how our lives were changed by knowing him, what good samskaras allowed us to be in the presence of such a saint. We compare notes, report incidents in minute detail, struggle to find expression for our feelings about him. Each new story is an invitation to enter more deeply into the mystery. For to us he represents enlightenment ... freedom ... God ... Rama ... Hanuman ... Krishna ... Shiva ... the play of form ... compassion itself ... a beloved and wise grandfather ... the closest member of our most intimate family. They say in India that God is like the sandal tree, and the Gurus are like the winds that diffuse the perfume throughout the atmosphere. We are intoxicated. Each of us knows him in our unique way. Each thinks that the Maharajji he knows is the true Maharajji. But he is fooling all of us. And seeing his many facets reflected through each other's stories and hearts, we come to know his play; to realize that his identities are infinite. And yet we still thirst to know him; to contain him with our minds. Oh that we could be to him as Hanuman is said to be to Rama: his very breath. He is our way home! He is the beloved! He is wisdom incarnate! He is grace itself! In these precious moments there is a suspension of the doubts or disbeliefs born of mind. There is no judgment, only appreciation. The tones of our voices reflect faith, reverence and wonder, delight in being privy to the cosmic joke, discomfiture at our own stupidity, and love so palpable that it is difficult to catch our breath. There are of course his miracles: his awakening of kundalini in others with a touch, his appearing in two places at the same time, his healing the sick and bringing the dead back to life. But those things are just the beckonings that entice us to the feast. Far dearer for us are the stories of his humanity ... his sweetness ... delicacy ... rascality ... tenderness ... his childlike delight in our delight ... his pain at our pain. In these timeless moments when we are together, egos are forgotten. We see it is not so important that he looked at us individually or spoke to us personally. For in relation to him we are a single "we." As he speaks to one of us, he speaks to all of us. For me and other Westerners, these moments of sharing in faith are especially precious because it is so difficult to speak of "Guru" in the West; so hard to express unabashed devotion; so culturally unacceptable to speak of the yearning to surrender to another being. But now, as we are gathered on Dada's porch with Maharajji in our hearts, it is as if we are not just speaking about Maharajji; he is here with us. Maharajji once said, "When anyone thinks of me, I am with him." And so he is. The moment itself is his darshan. And as our faith allows, he shows us through his eyes a speck of what he sees: the exquisite web of "maya," the dream that we call "life." He allows us to taste of his peace within, while at the same moment he is buffeting us with the winds of chaos. We are ecstatic; we are confused. And we ask ourselves, rhetorically, "Who can understand the ways of the Guru?" Dada begins another story. We have all heard it many times before, and yet we know that this time we may hear something new. For who we are at this moment is new to the story, and in this newness is another whisper, another touch of the divine. Dada is recognized as one of the devotees who has been closest to Maharajji. Their relationship has been so intimate for so long that we treasure Dada's stories about his "Baba" as especially precious. He is our elder brother in Maharajji's spiritual family. This man we know as Dada also has been Professor Sudhir Mukerjee, a professor of economics at the highly regarded Allahabad University. He edited a prestigious economics journal, was a political activist, delighted in ideological discussions with his many intellectual friends. He was a responsible family man whose household included his wife (Didi), his mother and aunt, and his brother and nephew. While he had grown up in a religious culture and family, he, unlike the women, had little interest or time for spiritual matters. And then into his life stepped Maharajji—a barefoot sadhu wearing only a dhoti. He moved right into Dada's home, uninvited. Initially, Dada was kind and courteous, as you might expect, though skeptical as befitting his role as a scholar. But his intellect found itself to be no match for his intuitive heart, through which he came to treasure Maharajji and acknowledge him as nothing short of God in form. Dada had been offered a ringside seat at the play of the Lord. And the price of admission had been giving up who he had been. Whatever Dada did, it involved a remarkable degree of surrender. For, by the time I met him, the transformation seemed complete. There was no sign of the Professor; there was only Dada. Maharajji had said to him, "You are mine," and so he is. As I listen to him speak in the darkness, I think back to when I first became aware of Dada. The circumstances under which we met were so extraordinary that I have remembered them vividly all these years. The meeting occurred in 1971. I was sitting on the floor in Dada's home in Allahabad with thirty-three other Westerners. And I was very confused by how we had come to be there. I had returned to India several months previously and started to search for Maharajji, but he was not always so easy to find. When I had exhausted the obvious possibilities, I decided to enroll in some meditation courses in Bodh Gaya, the place where Buddha had become enlightened under the bodhi tree. After almost forty days of practice, I felt the need for a change and decided to accept an invitation to a Shivratri celebration (night to worship Shiva, the Absolute) in New Delhi. A number of other Westerners who had been at the course decided to join me and, boarding a friend's bus, we set out. The route to Delhi took us through Allahabad, a stately old city with wide, tree-lined thoroughfares, and a fine university. But Allahabad was best known for the Prayag: the confluence of two of India's most sacred rivers—the Ganges and the Jamuna, with a third spiritual river, the Saraswati, coming up to join them from underground. For a Hindu, it is most auspicious for this life and afterlives to bathe where the rivers join, and particularly auspicious at certain moments determined by the position of the stars and planets. At these perfect times, many millions of the holy and pious come to Allahabad for the Mela (a month-long religious gathering where people camp on the banks of the rivers and bathe at the appropriate moments). When we arrived in Allahabad, one of these auspicious moments had recently passed. A member of our traveling group had been at the Mela and suggested we take a few minutes detour to stop at the place where the rivers meet. It was already late afternoon on our first day out of meditation. We were all tired, and still had some miles to go before arriving at our lodgings for the night. I, as the elder in the group, opted that we not stop, but go on. But then I began to feel that the decision was not appropriate. After all, we were in India on spiritual pilgrimage from the West, and this spot was among the most sacred in India. A little fatigue should not deter us. I changed my mind and asked the driver to make the detour so we could watch the sun set at the Mela grounds. When we arrived at that area, it was all but deserted: a vast sandy campground with the river in the distance. The driver asked where he should park the bus. The fellow in our party who had visited the Mela and brought us small medallions of Hanuman suggested that we pull up near the Hanuman temple. Just as the bus was coming to a stop, another member of our party shouted, "There's Maharajji!" Sure enough, Maharajji was walking with a companion just by the side of the bus. We all piled out and surrounded him, falling at his feet. Most of the group were seeing him for the for the first time. I was so overwhelmed by this "chance" meeting that I was holding on to his feet and crying uncontrollably. After some time Maharajji said something and the man with him translated that Maharajji wanted us to follow him in our bus. They got into a bicycle rickshaw and started off down the street. I still could not catch my breath or stop crying and laughing. After having thought about Maharajji for the two years since I first had been with him, the unexpected shock of this meeting left me ecstatic and confused. The rickshaw led us through a number of small residential streets and finally we stopped at a house into which Maharajji hurriedly entered. As we got down from the bus, the first thing I noticed was the smell of Indian cooking coming from the house. As we came up on the porch, the people greeted us as if we were expected. But how could this be? It turned out that earlier that morning, Maharajji had instructed the mothers of the house to prepare food for thirty-four people who would be arriving in the late afternoon. How did he know? And wasn't it lucky that I had changed my mind and decided we should make the detour? Perhaps there had been no "luck" involved at all! And now we were in Dada's house seated on the floor in long rows in the hall and living room. Leaf plates filled with steaming food and cups of hot chai had been set before us. Maharajji sat in the inner courtyard of the house making sure we were all fed what seemed like twice as much food as any of us could possibly eat, but we did. And then came the sweets—mountains of sweets. It was during this sweet feeding that I finally took notice of Dada. He was a dignified Indian man in his fifties wearing a dhoti, a white shirt, a black vest, and carrying a towel over his shoulder. He was moving through the group barefoot, with a large bucket of jaleebis, a particularly sweet confection which was deep-fried in ghee (clarified butter). With his bare hands, Dada was putting big mounds of the sticky sweet on each person's plate. It was the second time he had come around, so I covered my plate with my hands and said, "Thank you, but I don't think I can eat any more." My remark and hands didn't seem to deter him a bit. He just said, "You must take ... you must take ... Maharajji says you must take ... " And with that he deftly moved in around my hand and left a big pile of jaleebis on my plate. I was already stuffed to the point of nausea, and the prospect of eating more sweets, which a few minutes ago I would have craved, now seemed intolerable. Yet I realized that in a country where so many people go without food, one cannot leave food on one's plate. So at that moment I looked up at this man with a look which I hoped would convey my anger and irritation: he had just overpowered me. He was looking directly at me and I saw that my look didn't faze him one bit. He was just carrying out Maharajji's orders. It was as simple as that. After all, he knew that Maharajji was compassion itself. If Maharajji said we must have sweets, so we must ... irrespective of our wishes. Dada had become so much an instrument of Maharajji that there was no space between the order and its execution. Such a level of surrender was hard to comprehend. It was not as if Dada was a separate being serving Maharajji—he was the service itself. Gone was the decision-making process which chooses from moment to moment to serve, that self-conscious decision-making process that is all too familiar to most of us. I recall one day watching Dada serve Maharajji. Maharajji was in a very forceful mood—shouting orders in all directions for the maintenance of the temple and the serving of the devotees. From my vantage point on the sidelines I saw that he was giving many of these orders to Dada, and some of them seemed contradictory. After all, Dada was only one person, and yet Maharajji seemed to be asking him to do two things at once. Yet Dada never got the least bit upset, nor did he attempt to explain the contradictions to Maharajji. He would just say, "Yes, Baba," and do whatever it was that Maharajji demanded most recently. I watched closely. At one point Maharajji yelled, "Dada, go get Binod." Dada was halfway across the temple courtyard on this errand when Maharajji yelled, "Dada, come here." In mid-step, Dada's body turned immediately, responding to the new order which countermanded the earlier one. Here I saw two things. First, there was no momentary lag when Dada had to process the inconsistency of the orders and decide which to follow. More amazing yet, and something I saw at other times as well, Dada seemed to respond even as Maharajji uttered the first sound of the new order, as if he heard Maharajji's intention before the words were out. The intimacy between these men reminded me of the one-pointedness of mother-child love, when a mother can recognize her baby's cry from a great distance. I once heard a saying about the tuning of true devotees to their Guru: "They hear his faintest whisper above earth's loudest song; they see his slightest signal across the heads of the throng." In the late night darkness Didi comes from the kitchen, bringing us yet another cup of tea. It is long past bedtime, but what might sleep hold that could compare with this moment? Our hearts are as one in our love of him. We always want just one more story from Dada. For his faith never flickers. The purity, the power, and the obvious truth of his stories resonate deep within us, opening our hearts once again to our own innocence, reawakening in us our perfect faith. "Dada, tell us again. How did you meet Maharajji?"